Carissa Potter's optimistic print is hand colored. We all know it's smart to stay well hydrated, but there's also wisdom in a water glass that's only half full. Carissa Potter's optimistic glass-scape is printed on a letterpress and then hand colored by a collective of fellow Oakland artists, making each image one of a kind. 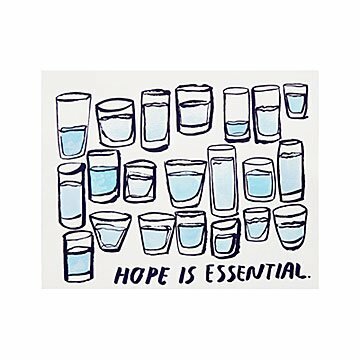 It's inspiration to keep things in perspective and remember that hope, like water, is essential. Handmade in Oakland, California. Originally from Minneapolis, Carissa Potter lives and works in Oakland, California. Her prints and small-scale objects reflect her hopeless romanticism through their investigations into public and private intimacy. Speaking both humorously and poignantly to the human condition, Carissa's work touches chords we all can relate to - exploring situations we've all experienced at some point in our lives and conveying messages we simply long to hear. Since 2010, she has been an artist in residence at Kala Art Institute in Berkeley, where she teaches letter-press. She also serves as a mentor in Southern Exposure’s One-on-One Mentor-ship Program. She finished her first book with Chronicle books in 2015 titled "I like you, I love you." in 2016, Carissa was an artist in residence at Facebook. Carissa received her MFA in Printmaking from the San Francisco Art Institute in 2010. Currently she is working on being a better listener and her second book, titled "It's Ok to feel things deeply." Everything about it is greatâ€”from the size to the colors. Will look great in a frame in my friend's office or home.